Unplanned urbanisation and mindless modernisation has led to the creation of environmental challenges such as improper dumping of garbage, polluting and burning of hazardous materials. This damages environmental and public health and needs to addressed. One effective way to tackle the situation is to drive behavioural change among people, especially children. 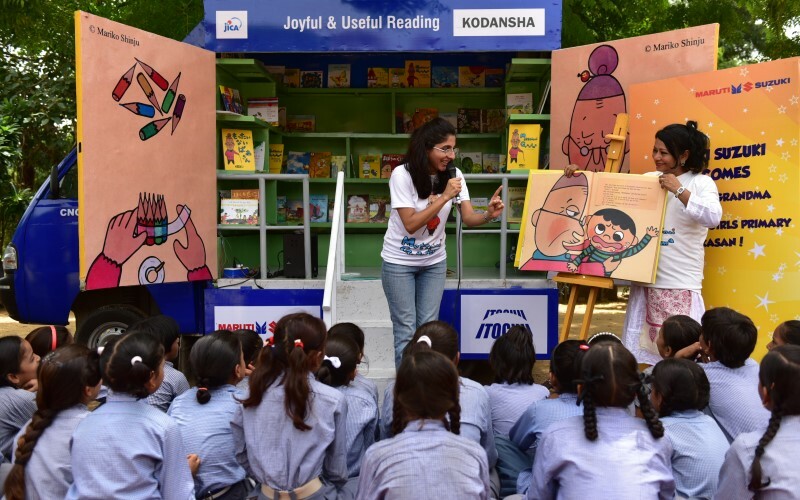 To do this, Maruti Suzuki India Ltd. along with Japan International Cooperation Agency (JICA) is supporting storytelling sessions based on Mottainai Grandma, a successful pictorial book published by Kodansha, a leading publication from Japan. The book is adapted in Hindi and English in collaboration with National Book Trust (NBT). Mottainai is a term of Japanese origin and has been used by environmentalists to convey a sense of regret over waste. The exclamation Mottainai! translates to What a waste! The word was first popularized in the global community by Nobel peace prize winner Prof. Wangari Maathai, when she used it in the United Nations as a slogan for environmental protection. The story telling caravan has been initiated by Kodansha with the objective of promoting Clean India Mission by creating environmental awareness among the students. School children, between 9-12 years are taking part in the activity and learning the values of cleanliness, use of resources and consciousness towards environment. The inaugural session was recently conducted at Girls Govt. Primary School, Kasan in Manesar. Maruti Suzuki has been working in the area of school education for over nine years under its Community Development initiative. The Company strives to increase enrollment, enhance retention and improve learning levels in adopted Government schools in communities around their manufacturing facilities. A caravan, a Maruti Suzuki Super Carry, loaded with over 300 books is going to accompany the story telling troop as a mobile library. The troop will visit 30 schools in Delhi, Gurugram and Manesar and spread the message of Swachch Bharat Abhiyan. NextWhy Is MyGov.in Promoting Plastic Through Competitions?